SOX and Carbon Mitigation Legislation: Deja Vu All Over Again? Maybe Not. Surely I am not the only one who recalls the debates of the 80s that culminated in the 1990 Amendments to the Clean Air Act (CAA90). Title IV-A of the CAA90 created the cap and trade program to limit sulfur oxides and nitrogen oxide emissions. At the time it was controversial and multiple campaigns were organized to assure its defeat. The CAA90 did pass, and not only did none of the apocalyptic events forecasted by its detractors happen, but it still performs successfully today. What I find remarkable when I think about those debates is that they seem nearly identical in tone, arguments and players to the current debate about mitigating carbon emissions. Yet today, all attempts at finding legislative solutions to mitigate carbon have failed. I believe there are several reasons. For those not present then, a very brief summary. Late in the Carter Administration sulfur dioxides from coal power plants were flagged as the cause of acid rain that was affecting the ecosphere, especially in the Northeast. Carter attempted to both fund research on limiting emissions but also encouraging utilities to switch from oil to coal to limit oil imports. When the Reagan Administration marched in, doing anything to mitigate oil use was left to the free market and acid rain was dismissed as a natural phenomenon. In fact one of the first steps taken was to appoint a dentist as Secretary of Energy whose mission was to close the department. Ultimately any real action was successfully delayed under Reagan but immediately taken up by the Bush Administration. They fostered a Republican “free market” scheme to regulate sulfur and nitrogen oxide emissions by creating an open market of emissions allowances, now known fondly as “cap and trade.” The concept was simple: let utilities decide the better economic choice – pay a known price to pollute or pay the cost of emission control equipment. CAA90 was signed into law with overwhelming bipartisan support; the sulfur and nitrogen oxide emissions trading markets continue to function, and function well. Ironically it was modelled on a cap and trade program that the Reagan Administration implemented to phase out leaded gasoline. So let’s look at the similarities between then and now. In 1980 the National Coal Association argued that sulfur emissions would decline over time even though new coal generating stations would be coming on line, so there was no need for regulation. This report was not given a lot of credibility. 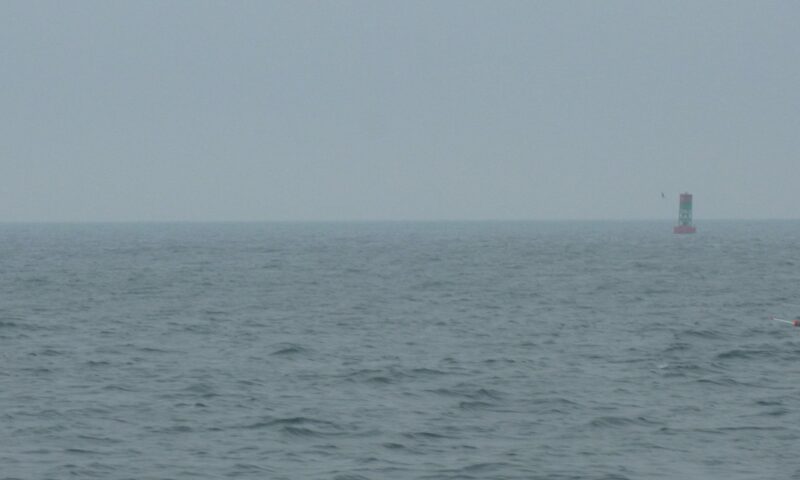 There are myriad websites and blogs churning out huge volumes of stories about how anthropomorphic climate change is a hoax and unscientific. Their argument are a hodgepodge of innuendo and logical fallacies sometimes amazingly contorted to support their position. Correspondingly, many reports and peer reviewed studies not only confirm what is happening to the planet but are revealing the fact that change is becoming quicker and less predictable. Most of these reports were funded by the Tobacco Institute, via their think tank at the time, the Alexis de Tocqueville Institution. Alan Katzenstein also generated lobbying reports for both the tobacco industry and against the idea that there was a link between coal emissions and acid rain. Two key members of the Institution, Paul Seitz and Fred Singer, both physicists, began to ally themselves with the Heartland Institute, founded by one of the founders of the Alexis de Tocqueville Institution. Heartland embraced the tobacco campaigns but then began to lean heavily into climate change issues and Seitz and Singer led studies on why man is not affecting the climate with greenhouse gas emissions. Heartland and a host of other “organizations” of a similar ilk have found new donors in Koch Enterprises either directly or through its surrogates, the Americans for Prosperity and the American Legislative Exchange Council. 1983 Edison Electric Institute (EEI) releases study claiming that acid rain legislation would require its member companies to significantly raise rates. Two utilities would have to increase rates by 50% or more; eight expected an increase of 20% or more. 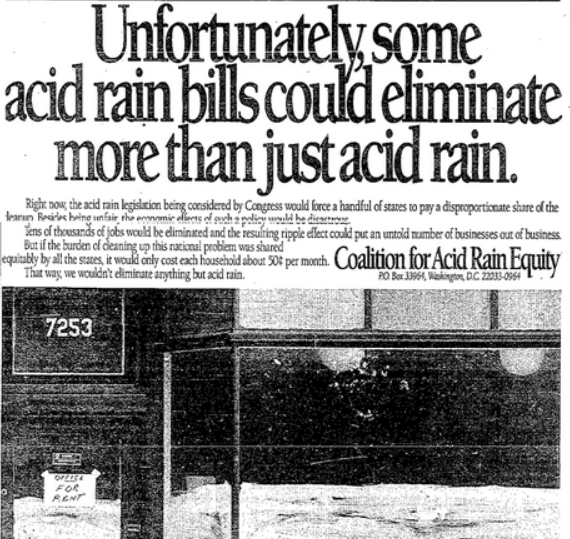 1986 “Citizens for Sensible Control of Acid Rain” claim acid rain legislation will cost $110 billion and would mean up to 30% higher electric bills and destroy the economy. “Citizens…” actually Consolidated and Peabody Coal, two American Electric Power operating companies, the General Public Utilities companies and American Cyanamid. The Coalition for Acid Rain Equity published the following ad claiming the loss of tens of thousands of jobs. National Economic Research Associates on behalf of the American Coalition for Clean Coal Electricity: increase in utility costs of $184 billion, or $18 billion per year. Retail ele3cticity to increase by between 12% and 24%. ALEC 50% increase in cost of gasoline and residential electricity; 75% increase in cost of industrial electricity and residential natural gas; and 600 percent increase in utility coal prices. $20 billion in added annual costs. In June 1987 the New York Times reported that the “Industry opponents of legislation to control acid rain were the champion spenders among Capitol Hill lobbyists in 1986.” The article noted that of the $60 million spent, the largest single spender was the Citizens for Sensible Control of Acid Rain. In 2012 dollars, the amount spent in 1986 amounts to about $124 million. Utilities and oil and gas industry spent $510 million between January 2009 and June 2010 on lobbying to defeat the energy bills under consideration at the time in both the House and Senate. One single entity, Koch Enterprises, funneled $25 million through 35 lobbying organizations; $6 million through its PAC; and $38 million in direct lobbying in 2010. In the lead up to passage of the CAA90 we witnessed multiple campaigns to defeat this legislation. Today we have campaigns mounted against any new legislation that involves carbon mitigation. For the most part the same antagonists are at work today making very similar arguments to those made 20 years ago. But CAA90 did pass, SOX and NOX cap and trade was implemented and as we well know, no economies were harmed nor did retail electricity rates skyrocket. Today, though, all attempts at finding legislative solutions to mitigate carbon have failed and are likely to fail in the near future. I think we can look to four factors: money; the internet; polarized politics; and the right wing entertainment industry. As noted above, considerably more money is pouring into anti carbon groups and campaigns beyond anything imaginable in the 80’s. In addition to legislation, enormous amounts of money are targeting the EPA’s rulemaking on carbon caps. The shear volume of money available to counter legislation is exacerbated by the Citizen’s United case allowing for much more corporate funding of politics with far less transparency. There are no reliable summations of how much is being spent where and by whom. 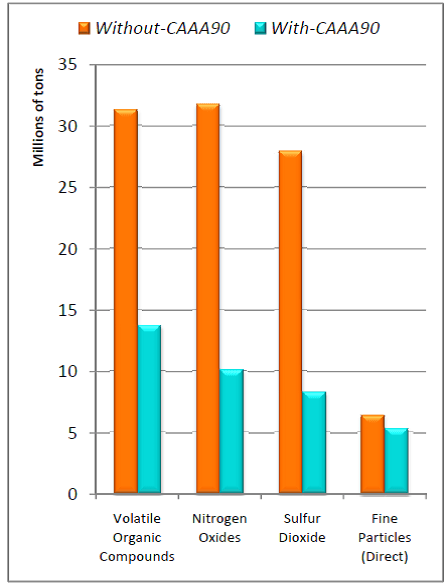 In the case of the period 2009 to 2010, opposing groups spent about 7 times that of groups in support of the legislation. The internet did not exist in the 80’s, so the dialogue about SOX and NOX really had limited reach to the general public. Those at odds were still the establishment and the battle lines were drawn based more on self-interest than any partisan position. Currently there are hundreds of blogs churning out enormous amounts of misinformation to folks only superficially aware of the issues and challenges. The primary activist groups can get information out in fire hose quantities that can overwhelm legislators. CAA90 voting fell on lines of self interest. Legislators from both sides of the aisle in areas where coal was king were allied. Both parties supported environmental stewardship. It passed with significant majorities in both houses. Today we are well aware of the partisanship and polarization that exists. Carbon mitigation to some is just another liberal folly. Others, paranoid about global government and socialism, have been gullible to the argument that carbon controls are part of a grand conspiracy among scientists who are complicit in enslaving the world and who want to preserve their research funding. The right wing has adopted as dogma that man made climate change is a hoax foisted on Americans and the only patriotic thing to do is oppose it, not realizing where the anti-carbon arguments are coming from. Finally there is the right wing entertainment industry that generates propaganda through outlets that allege to be news organizations and political commentators. These players have large audiences who believe them to be the sole source of truth and those audiences vote for candidates who sound like their favorite TV or radio program. Roger Ailes was just a political consultant in the 80’s and did not get to Fox News until 1996. Limbaugh did not become popular until just prior to when CAA90 became law. They can marshal a very vocal minority to the extent that Republican lawmakers will not risk running afoul of them. That collection of entertainers inflames the polarization already present and stokes the “global warming is a hoax” flames. However daunting it might seem trying to combat these four factors, a few things are happening that hold promise. The civil war within the Republican party is fracturing alliances and may prove to break the tea party hold on its policies. Republicans are now being opposed by other Republicans with the same opaque money machines fueling ALEC and AFP. A small group of Republicans, led by former Representative Bob Inglis, understands that the party is on the wrong side of this issue and is trying to turn it around. And a handful of tea partiers who have compared energy policy with their ideological values are now supporting solar and distributed generation. The next several years will be interesting.